There are two distinct issues facing East Chop Drive, each with its own potential solutions and stumbling blocks. On one end the undermined bluff imperils the road and potentially some houses. On the other end, which lies near or at sea level, repairs are needed to prevent the road from being washed out by storms. And as the town finds itself saddled by the logistical and financial challenges, many say this is an issue of Islandwide concern. Losing the road would mean losing one of the Island’s most scenic vistas and one of the few public roads with a sweeping ocean view. Hanging over all these plans and concerns is the reality that even with a perfect alignment of effort — planning completed, approvals granted, work done — for future generations, East Chop Drive will exist only in memory. Just like the tennis courts and croquet matches on the bluff. East Chop Drive, about a mile and a half long, starts by the Oak Bluffs harbor and wraps around the chop that juts into Nantucket Sound. It passes the East Chop Lighthouse as it ascends the bluff, and later descends, passing Crystal Lake to the left as it ends with a jog inland toward the Martha’s Vineyard Hospital. The road and the houses that line it have sweeping views of the sound and the mainland, as ferries and boats make their way in and out of Vineyard Haven harbor. “Oak Bluffs and Aquinnah, I think, are the only towns where you can drive along the shoreline, and the public can enjoy the view the whole way,” said town conservation agent Elizabeth Durkee. But for well over a century the vista has been imperiled. In 1888, geologist Nathaniel S. Shaler wrote that erosion was rapid on the east side of East Chop, and the bluff was reportedly eroding three feet per year. Efforts to protect the bluff, led by the town and the East Chop Association, which owns the bluff, have been ongoing. In the past 100 years bulkheads have been built and riprap (rocks used to protect shorelines) has been placed along the bluff, with work done by the state and the Army Corps of Engineers. In the 1970s, beach grass, rosa rugosa and crown vetch were planted as a means of stabilization. In 1969, the East Chop Association suggested rerouting tour buses and other heavy traffic away from the road. 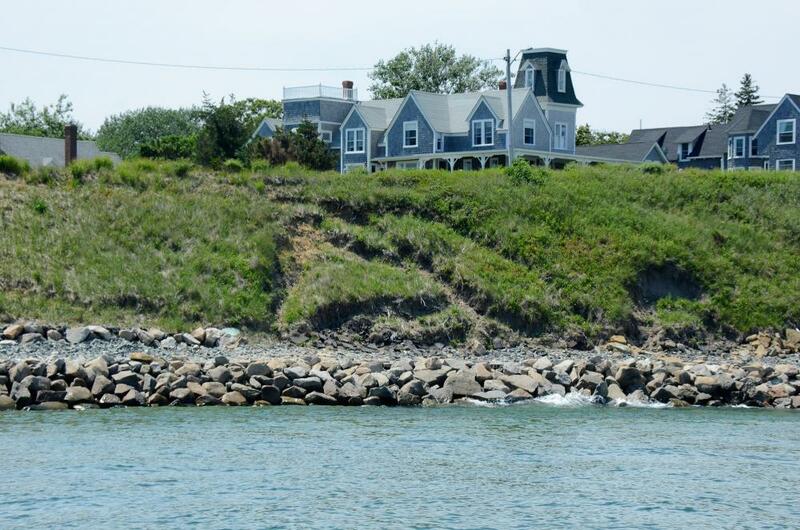 A 2009 study of the bluff commissioned by the town included test borings that found the slope does not meet minimum stability factors for safety and may erode quickly if exposed to waves. “Rapid deterioration with significant erosion may occur if waves start to overtop the heavy riprap wave break and contact the bottom of the upper slope,” the report said. It also said a period of heavy rain could destabilize areas of the slope, and it recommended limiting traffic during storm events. The last time major work was done at East Chop was after Hurricane Bob, the August 1991 storm that wreaked havoc on the Island and closed the road for more than two years. The foot of the bluffs was again stabilized with riprap. According to those involved in protecting the bluff, the work done at the time went to the lowest bidder and was inadequate. Lower East Chop Drive left exposed after Sandy. About 20 years later, another hurricane made its mark — last October’s Hurricane Sandy, which “threw [East Chop] for a loop,” Mrs. Durkee said. After Sandy, the town noticed some vertical slumping in the bluff, in which the bluff was carved out from the bottom so the top slumped down. Waves were overtopping the revetment, Mrs. Durkee said, and there is no sand in front of the revetment to nourish the beaches or protect the bluff. 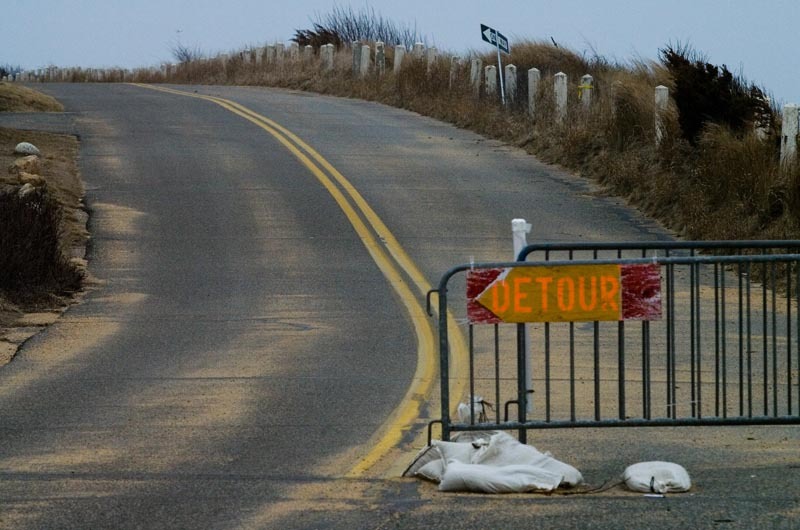 The road was closed in one direction for most of the winter, both above the bluff and on the lower end where the road travels between the sound and Crystal Lake. There the dune has eroded to the point that big storms wash out the road, and some fear that Crystal Lake, a freshwater pond, could be breached. “The problem is that every time the waves go over the road, it’s so low there it floods,” Mr. Whritenour said. “But in addition to flooding, without putting a harder edge curb on it, the waves scour the material from underneath the road, and that loosens the pavement so the road pavement is washed into the wetlands. And we don’t want that to happen.” This year, a February blizzard washed out the lower end of the drive. For a time, there was concern that because the bluff was owned by the private East Chop Association, repairs would not be eligible for state and federal funding. The town only owns 20 feet on either side of the center line of that road, Mr. Dripps said, and the association owns everything beyond that. This led to discussions about transferring guardianship of the bluff from the association to the town, but those plans fell through. The town has since learned that because of the many years of protection efforts by the town and other government agencies, the private ownership issue is not a problem. “Because the state and the federal government and the town have protected the bluff over the years consistently in order to protect the road, it’s kind of established that that’s the procedure,” Mrs. Durkee said. The town is working long and hard on those questions, finding that solutions are neither easy nor cheap. Plans for the bluff, developed by CLE Engineering, call for armoring the toe of the bluff with additional revetment and reducing the slope of the bluff, Mr. Whritenour said. “If the bluff is stabilized and vegetated properly, that should protect the road. It’s the protection of the road that’s critical, and the only way to do that is to stabilize the bluff,” Mrs. Durkee said. 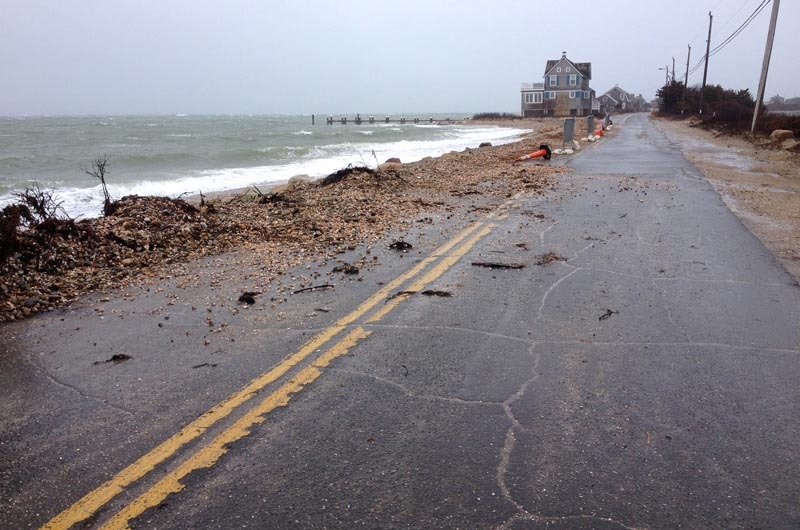 Total repairs in Oak Bluffs from Hurricane Sandy are estimated at about $15 million, Mr. Whritenour said, with the bluffs accounting for about $12 million of the cost. The town is looking for funding from a variety of sources, but hopes that the Federal Emergency Management Agency (FEMA) will supply a good part of the cost. The agency will reimburse a town up to 75 per cent for engineering and repair costs. Town meeting voters this spring approved spending $75,000 for engineering on the project. But so far the funding has hit roadblocks, and the price tag hits especially hard for Oak Bluffs, which is now getting back on track after a spate of financial problems. The town recently erased a nearly $1 million free cash deficit it had two years ago. After closing part of the road to traffic all winter, the town road and byways committee decided to reopen it over the summer, with posted signs prohibiting heavy traffic. Mr. Whritenour said the highway department does daily and weekly monitoring of the top of the slope to make sure it isn’t too close to the road. Road was closed to two-way traffic this winter. Reopening the road may have been controversial, Mr. Dripps said, but was a lesser of two evils. When the road was closed, he said, traffic flowed into East Chop’s side streets, creating a hazard for bikers and pedestrians during the summer months. Down on the lower end of the drive, the town did some emergency work over the winter, including putting some rocks on the side of the road. To protect the road further, the conservation commission approved a proposal for gabion mattresses (cobble rocks stabilized with plastic) along the dune area. Sand and plantings would be put on top of the mattresses so vegetation would grow and establish a dune system where there is no dune now, Mrs. Durkee said. The plan would protect the road from being scoured during storms and high water. Mr. Whritenour continues to make trips to Boston to meet with the DEP, and said bluntly that inaction is not an option. “They won’t approve that, but we’re not going to say it’s okay to just leave it like it is because it could get washed out again in the future,” he said. DEP spokesman Ed Coletta told the Gazette that the state is open to allowable solutions. “Certainly the Mass DEP is working with the town and its engineer to come up with a solution that meets both their needs and our concerns as well,” he said, noting that the issue is armoring barrier beaches. “Barrier beaches are very dynamic in nature and they migrate, and our focus is trying to allow that migration to happen naturally, and armoring a barrier beach doesn’t allow that normal movement,” Mr. Coletta said. Armoring causes more serious environmental issues at each end of the structure, he said. “So we’re working with the town and going to try to come up with a solution,” he repeated, declining to speculate what other options might be. He noted that the issue is hardly unique to the Vineyard and is happening across the state. “Climate change and sea level rise really is leading to more serious storms that cause more erosion, so we expect to see more of these issues arise,” he said. Oak Bluffs selectman Walter Vail said there have not yet been discussions about what will be done if the funding doesn’t come through. “I guess we don’t want to face up to a no answer from them,” he said. The town would also need to figure out how to pay for the remaining 25 per cent of the cost. “One step at a time right now,” he said. A few things are clear: East Chop is in trouble, and the drive might not be around forever. And that, most agree, would be a loss to the entire Island. To be sure, there are houses on the bluff that may eventually be in trouble, though none are immediately imperiled. If the road is lost, all but one East Chop house are accessible through other routes, Mr. Dripps said. The road provides local access to the hospital and downtown, saving time in an emergency. But most of all, it’s a treasured vantage point. “Oak Bluffs has the advantage of being the only town on the Island where you can see water from one end of town to the other,” said Joan Hughes, chairman of the conservation commission. Craig Dripps, president of East Chop Association. Mr. Vail and his wife walk on East Chop Drive year-round. “I love walking that walk. It’s the most beautiful walk and I don’t think it gets any better . . if we lose it, it’s lost forever,” he said. Mrs. Durkee said she doesn’t think the road will be there in another century. “[But for now] there are a lot of big decisions that are going to have to be made in the future by the towns to decide how to adapt to climate change, to erosion and flooding and sea level rise,” she said. “And this, the bluff stabilization project, is something which could be hopefully a long time solution to protect the road. Mr. Dripps echoed the sentiment. 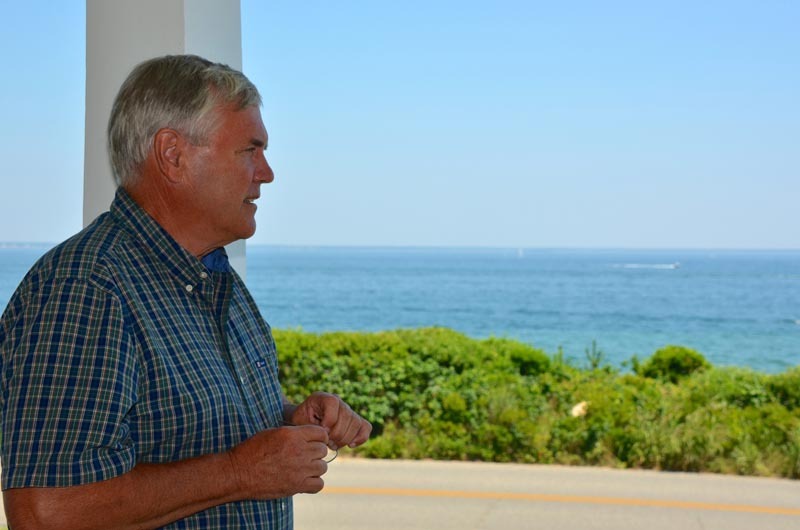 “I can’t emphasize enough how cooperative and expeditious and involved [the town has] gotten, because this is maybe one of the nicest views on the Island,” he said in an early summer interview as he sat in a rocking chair on the porch of his family home. He looked out to the sweeping view of the sound and the mainland, with buoys clanging in the sound and birds chirping in the bushes. He recalled that as a kid, he planted poison ivy along the bluff to discourage foot traffic, only to see a neighbor trying to kill it a few days later. “If you do it today I guess you’d have a lawsuit. There’s some there,” he said, gesturing toward the bluff. He recalls that in the 1950s and 1960s the town used the bluff as a dumping ground, with dump trucks backing up and depositing macadam and concrete, old chimneys and even Tubby Rebello’s old swimming pool down at the bottom of the cliff. Now, he needs a permit to prune the vegetation on the bluff. He stopped to observe a rule-breaking tour bus drive by.